I'm rather exhausted today... had half a night, and a way-too-early morning. Frieda woke up from the rumbling earthquake at 4-am, and once awakened by the ground shaking, it's not that easy for me to relax back to sleep and leave her alone in the crib with her bedroom door shut... Ended up having her with me in bed, and not getting that much sleep. You think I'd be getting used to them like my husband (the born-and-bred LA boy), as they have happened every summer since I married! But it seems they just make me more frightened each time. Scared that each 4.5 is a simple pre-quake, I busy myself closing all the kitchen cabinets tightly, moving and large vases in the bedroom to the floor, keeping Freida away from the bookshelves or TV etc. for the next 24 hours! It's exhausting and probably pathetically unnecessary and overtly-paranoid of me - but I honestly am not ready to treat it as is... the calamity possibilities still freak me out. I'm a bit sick of the worrying, of feeling like I'm not at all prepared, and of thinking I may regret not being in the know, should the "big one" ever happen - God forbid - I have decided to at least take the easiest bit of precaution so as not to feel unsteady, or risk feeling regrettably unprepared. I will finally get online and order the Disaster Survival Kit (that is suggested for all Californians to keep at home). 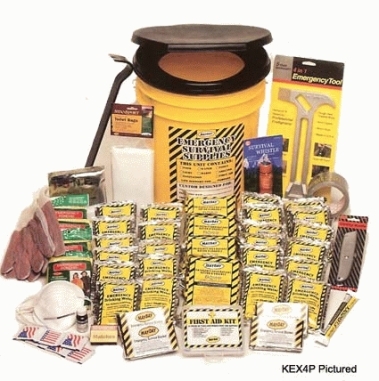 All the emergency survival supplies needed to make it through even the worst kind of disaster, all packed into one compact airtight bucket (toilet). They come in different amounts (1 person, 2 people etc). I hope this will help me feel a bit more proactive about something that technically there is nothing much to do about... You can order one here.